It is not difficult (she says) to set down the rules I follow for taking care of my hair. Greatly as I prize and value my gift, I am no slave to it, for I devote only about three-quarters of an hour every day to its care. If women generally did the same, I have no doubt that in a short time they would soon notice an improvement in the condition of their hair. The first essential, in my opinion, is to keep both the scalp and hair perfectly clean. It may seem superfluous to say that to women who realise the necessity of keeping the whole body clean. Especially is this the case with regard to Englishwomen, who have a bath every day. I am perfectly certain that much washing of the hair with water is bad. As a matter of fact, I wash my own hair as seldom as possible. I cannot give any exact interval of days or weeks when the hair is to be washed, for that depends on circumstances. In the dark, foggy days, when there is much dirt and soot in the air, the hair naturally gets more dirty, and may therefore require more frequent washing than in the light, bright days of summer. Still, even under these conditions, it is possible by much brushing to avoid any excessive use of water. When the hair is washed, it should be allowed to hang down until it dries naturally in the air, as I do not believe in rubbing it with a towel or using hot irons for the purpose of driving off the moisture. Those things are bad – very bad. Hot irons ruin the hair. The woman who uses curling-tongs courts disaster. The heat dries up the natural oil which is supplied by the little oil glands at the roots of the hair and keeps it soft and moist. The result of tongs or of heat is to make the hair brittle, so that it breaks off short. It stands to reason that if you are constantly breaking the hair it will never get long. Only once in my life did I ever have my hair curled with curling-tongs. That once taught me my lesson. The hairdresser used irons which were too hot, and he burnt a lot of the hair in the middle of my head. Since that day no hot irons have ever been put near my hair. Although I so strongly disapprove of washing the head with water, it is possible, as I have said, to keep the scalp and the hair quite clean by brushing it. To do this, perfectly clean brushes are absolutely necessary. My own brushes are washed every day. When once a brush has been used it is never allowed to touch my hair again until it has been thoroughly washed and dried. Doing this regularly becomes a matter of routine, and it takes scarcely any time at all, although I know only too well that when these things are done only occasionally they seem to take a great deal of time. Another reason for brushes taking so much time when they are only washed occasionally is that they are really dirty, and to clean dirty brushes must necessarily take longer than to wash those which have only been used once. If you think of it, it is no more nice to brush your hair with dirty brushes which have not been washed for two or three weeks than it is to dry your face with a towel which has not been washed for the same time. Every morning when I get up my maid brushes my hair. As it is so long I have had to have a specially high stool made to sit on. The maid brushes both my scalp thoroughly and my hair from the roots to the end for half an hour. The other quarter of an hour I devote to dressing it for the day. In addition to keeping the hair perfectly clean, this brushing prevents the possibility of any scurf or dandruff – and scurf is death to the hair. It may come because the hair is too dry, or it may be due to the hair being too greasy. To whichever cause it is due it should be cured at the very earliest moment it is seen, so that it may not cause the hair to drop out, as it most assuredly will if it is neglected. I should strongly recommend the doctor being called in when there is scurf, but sometimes a home remedy like “golden ointment,” which is a compound of mercury, will cure the condition rapidly. In that case, what I have said about washing must be ignored for the time. The ointment must be well rubbed into the roots of the hair at night, and washed out the next morning. In the course of a week of this treatment the scurf ought to be quite cured. If the hair is very dry, it is a clear indication that the little oil glands are not supplying enough nourishment. This must, therefore, be supplemented by the use of a little good brillantine. It is not a good thing to put it on all over the hair. What should be done is to dip the tips of the ringers into the brillantine and rub it well into the scalp until you feel a distinct tingling. The result of this massage causes the blood to circulate very freely in the scalp, and so takes to the oil glands the material they need to make the oil they secrete. At the same time the glands are stimulated to take up the oil which has been rubbed into the scalp, so that the massage acts in a two-fold manner. Dry hair is invariably dull hair. Now, there is an undoubted beauty in seeing hair shine and reflect the light. This effect is produced by the natural oil, supplemented by the use of the brush. When, therefore, the natural oil is absent, it is well to put the smallest quantity of brillantine on the palm of the hand, and then rub the bristles of the brush over the palm. In this way they get an infinitesimal quantity of oil on them. This little is, however, quite sufficient to make the hair shine without being enough to damage the hair in any way, provided that the brush is used enough. I need scarcely say that as the oil glands improve in health by the massage, the need for even the exceedingly small quantity of artificial oil will be done away with, and the daily brushing will be quite sufficient to give the hair that wonderful sheen and lustre which are so desirable. One of the Queens of France, who was famous for the beauty of her hair, used to make her maid brush each of the four strands, into which she divided her hair when it was dressed, a hundred times. And her hair always grew luxuriantly and kept its beautiful youthful appearance all her life. Another advantage of brushing the hair so much is to give a sensation of great lightness to the spirits. Indeed, a headache can often be cured by massaging the aching part and then well brushing the hair. People often ask me whether I believe that cutting the hair and singeing the ends with a lighted taper is beneficial for the growth. I am quite sure they do great good. I have the ends of my hair cut and singed very often. With many people the ends of the hair have a great tendency to split. In the first place, if these ends are kept cut, the splitting will be prevented, and, in the second, if the ends have split, the cutting will prevent the split from proceeding farther and ruining the hair. Just as the gardener cuts the branches of the young trees to make them grow stronger, so, it would appear, it is necessary for us to clip the ends of our hair if we would have it attain the most luxuriant growth of which it is capable. Indeed, the habit of the gardener in taking care of the beautiful flowers which are entrusted to his keeping might well, and should undoubtedly, be followed by every woman with regard to her hair and that of her daughters. It was no doubt this care bestowed on my hair when I was a girl which helped to make it grow so long. As a matter of fact, when I was a child I was not noted for the length of my hair. It was no longer than that of any of my companions. 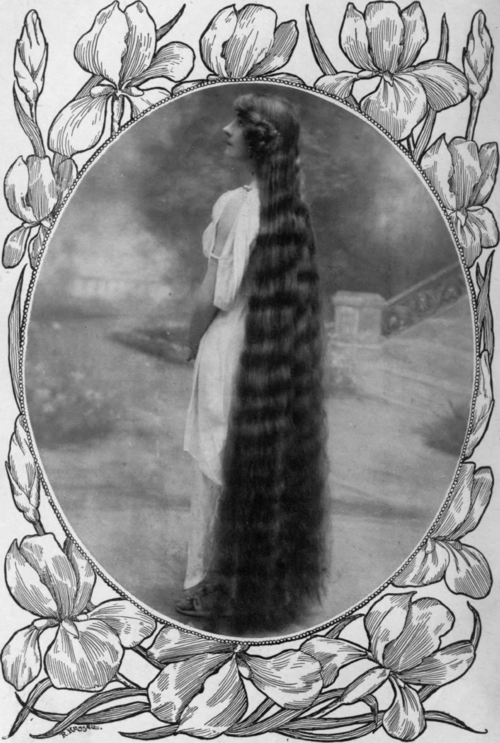 By the time I was thirteen or fourteen it had reached my waist, and many girls have hair as long as that. It was when I was sent to a convent to finish my education that my hair began to grow luxuriantly. One of the nuns had a special lotion which she used for her hair. She gave me the recipe for it, and I have used it ever since. Unfortunately, I cannot make the recipe public, as I promised to keep it a secret. Every doctor, however, can give a prescription which, if persevered in, will make the hair grow. One thing which I find disconcerts some women, and is even a matter of grave concern, is that, at times, their hair falls out. Mine does, too. Sometimes, indeed, it comes out almost in handfuls. So much has come out that I have a great big box full of these “combings.” I never worry about it. I know from experience that just as the hair falls out, so it grows again. It is the law of nature. It’s funny how much of her advice–don’t over-wash your hair, avoid damaging styling–is similar/identical to what’s given now. I can’t imagine how long it took for her hair to air-dry, though. Yeesh! Yeah! I noticed that as well. Her advice is so uncanny! Oh my goodness this is great! Just a note: NEVER put mercury on your skin or your hair. Ever. They didn’t know it back then, but it is REALLY bad for you. As in potentially deadly. Dandruff isn’t worth dying over.